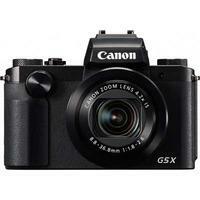 The Canon PowerShot G5 X compact camera brings expert-level control and uncompromising image quality into a classically-styled compact that's small enough to take anywhere. The G5 X sits below the G3 X in Canon's G-series compact camera line-up and combines a 1.0"-type back-illuminated 20.2-megapixel CMOS sensor and bright 24-100mm f1.8-2.8 wide-angle zoom to deliver sharp detail in even the most challenging situations. The large 3.0" vari-angle touchscreen allows for quick fingertip control and low-angle shooting, whilst the centred OLED electronic viewfinder offers advanced shooters DSLR-like handling and maximum comfort.